Over the last few weeks, we’ve seen a lot of growth at Waukeela. It’s something we see every summer: girls gain confidence, start sharing more, make new friendships, and trying things out of their comfort zone. This growth happens in every age group, but we see a significant positive change in our newest campers. First-time campers aren’t just trying new activities and building skills, they are putting themselves into a totally new experience by being away from home. There are so many situations in life where girls will have to be independent and resilient. When girls come to Waukeela for the first time they are able to build these skills surrounded by people who truly care for them. 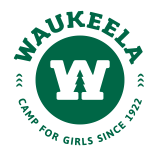 This is what sets Waukeela apart from all the rest: girls become part of our sisterhood as soon as they set foot on the camp grounds. For new campers that means that making new friends, adjusting to camp life, and finding confidence all while having fun. As first-time campers adjust to the rhythm of camp life, they have tons of activities to choose from. These activities can range from fun to challenging to adventurous to even just relaxing and therapeutic! As you can see, there’s a little something for every girl. For this reason, many new friendships are created in activities. Girls are surrounded by others who have the same interests and hobbies. However, the real benefit of our activities lies the incredible growth we see in each girl every summer. Since we accommodate all skill levels, every girl can improve her abilities and set goals for herself. Our staff are trained to help girls actualize their strengths and build upon them in positive ways. This means that, even as a new camper, your daughter can experience all the activities she is interested in and at the level she is comfortable with. Our returning campers are familiar with the camp experience of living tech-free and spending the whole day having fun in the present moment. However, for a first-time camper, this experience is probably pretty different from what they are used to. With so much to do and activities to try, new campers quickly adjust to this new schedule. The transition is a very pleasant one, our new campers have no problem spending the day doing the things they are passionate about! When campers return home from their first summer at Waukeela, they bring so much more than fond memories. They bring the strength it took to try something new and be away from home. They bring the friendships that were made away from screens and social media. They bring the pride and accomplishment they felt when they met their goals at camp. As you can see, being a first-time camper at Waukeela is a very special and beneficial coming of age experience.